May 22nd, 2018 Joey J. 2003 — a momentous year for cigars. You see, fifteen short years ago is when the Five Hour Energy shot was first introduced to the market, and after becoming incredibly wired and going on a two week buying bender, the team at Cigars International began mutating into the deal-driven, price-slashing monsters we are today. Wait, wait, my editors tell me that’s not quite right. Ah, yes, in addition to our productivity increasing tenfold thanks to taurine-filled capsules of goodness filling our trashcans, 2003 is also the year that Rocky Patel began putting his name on cigars. Think on that for a minute. Sure, Rocky was making cigars in the 90’s, but it’s just fifteen years back that the man we all know now began his path towards household recognition. Today? Rocky Patel is basically the most recognizable cigar manufacturer on the planet, bordering on rockstar status. Indeed, I’ve witnessed grown men swoon upon mere sight of Rocky at our retail stores, like teenaged girls at a Backstreet Boys concert. And for good reason! Producing dozens upon dozens of blends, Rocky is inarguably in the top three most successful, prolific, and important cigar makers working right now. That long lead in brings me to my review cigar today: the Rocky Patel Vintage 2003 Cameroon. Phew! Only took me 200 words to get to the name of the cigar today – how’s that for short and sweet? Indeed, while my introduction might be overblown, let me assure you the hype for this blend is not. After sampling nearly every RP on the market (a task that would take you about seven months to achieve, if you tried one a day), the ’03 Cameroon remains my favorite Rocky to date. So what’s the big deal? Let me assure you: it’s no secret sauce, ancient Chinese secret, or treasured, proprietary fermentation process. Nope. It’s just age and quality. You see, each Vintage ’03 features an absolutely stunning African Cameroon wrapper leaf, aged a minimum of eight years. I don’t want to get too “inside baseball,” but I do want to impress upon you how difficult it is to find quality African Cameroon leaf. 1.) Authentic Cameroon leaf is smaller than most of the other tobaccos on the market, meaning, quite simply, there’s less tobacco to work with. 2.) Its a toothy, veiny leaf. That doesn’t mean it’s bad, but cigar consumers demand a certain look to their wrappers, and it can be difficult to find Cameroon that works for it. 3.) The leaf is delicate and thin, almost like Candela, which demands that only the most skilled rollers craft the cigars. 4.) Finally, Cameroon leaf takes longer to ferment and age properly, so it requires a longer time (and therefore money) investment from manufacturers. To make a long story short? It’s impressive, requires dedication, and is rather rare. Combine the Cameroon with a Nicaraguan binder, and Dominican and Nicaraguan long-fillers, and you’ve got the beauty at hand today. Toasting this one up, you’re going to get a nice amount of rich, almost syrupy sweetness (that’s the Cameroon). As you progress, soft spice gets added to the mix, but not too much. If anything, the cigar starts to veer more towards a smooth, coffee-driven profile than a peppery one. As for the construction, I couldn’t ask for better. The ash holds on well, not flaking off, and the draw is flawless. Basically, exactly what you’d expect from an RP blend. By now, this review’s gone on long enough. So let me give you my final thoughts. Vintage ’03 Cameroon is not only an amazing Rocky Patel cigar, it’s one of the best Cameroon offerings on the market. 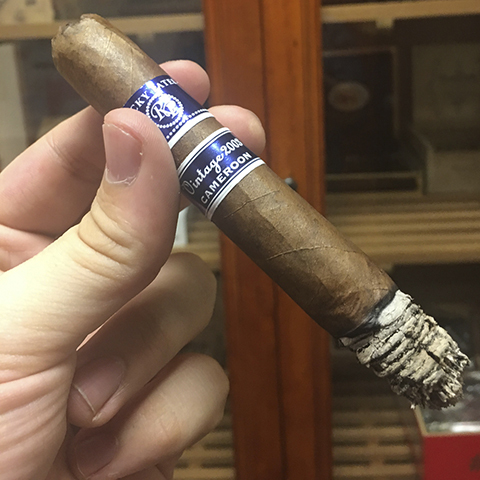 If you’ve never tried it, do yourself a favor and pick some up: the unique blend will expand your cigar knowledge and let you try something new. Just don’t blame me once you get the craving for some more Cameroon in the future — finding a better cigar than this is gonna be tough.